Polly #11 Sits Beside an Active Volcano! 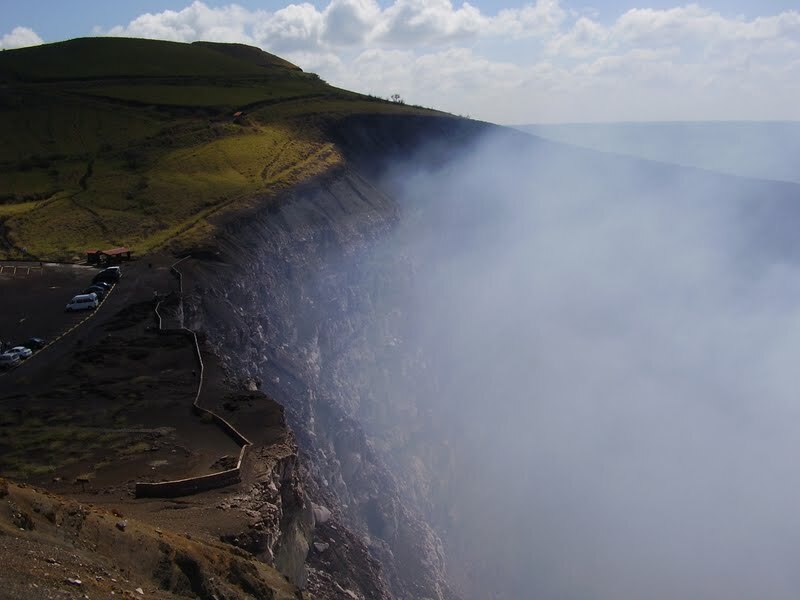 In December I went to Nicaragua and did something really risky — I spent a morning at the edge of an active volcano, at the Masaya Volcano National Park. It smelled like sulfur dioxide gas, was really smoky, and could have erupted at any minute! This is me at the edge of an active volcano! Everybody who drives there has to back their car into the parking spaces so that all the cars are facing the exit, just in case the volcano explodes and you want to make a fast escape. 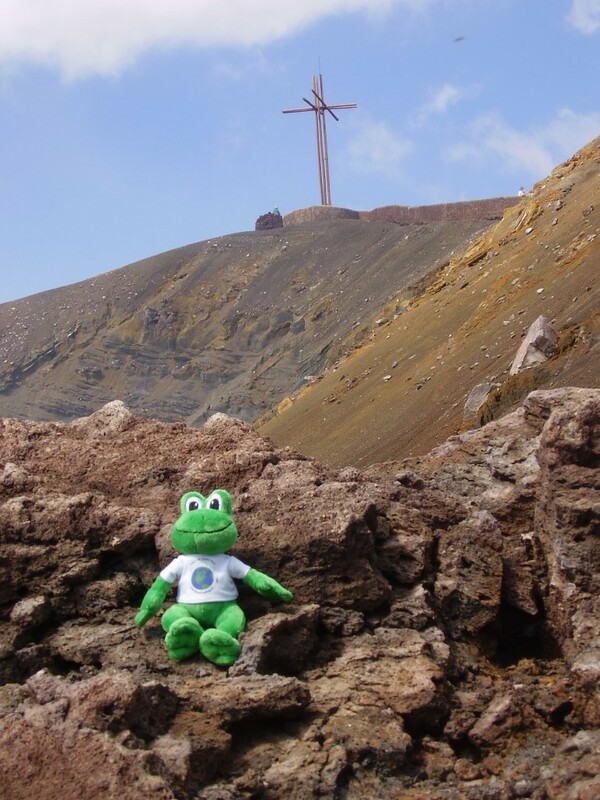 Looking out over the volcano is a replica of a Spanish cross, “La Cruz de Bobadilla,” which was put there in the 16th Century to ward off evil. I’ll tell you what, the Masaya Volcano is a very good place . . . but it doesn’t smell so good! This cross is a replica of the original cross that was placed in the same spot by 16th Century Spaniards. This is how the Masaya Volcano looks when you're standing on the hill right beside the cross. This is an interesting combination of science and history. Thanks for sharing! 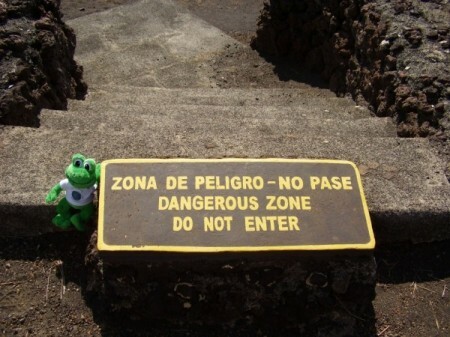 Wow, it must have been exciting (and a little scary) to sit on the edge of an active volcano! I’m just wondering, did it smell like rotten eggs? Thanks for posting! I really like the pictures! I’d like to go there sometime. It looks like the cross has an extra set of beams. Is that indicative of the original Spanish cross? I’m guessing that it makes the cross symbol visible from all directions. At any rate, I love a mystery, and I’ll have to “google-up” more information. This is interesting. Thanks! How can Polly sit near the volcano? Wouldn’t it burn her? How hot was it? How did the vocano smell? Did you sit with her? We like your pictures. Thank you. I really think it would be amazing to sit next to a volcano. Not many people can do that! Two, Four, Six, Eight…who do we appreciate? Polly #11! You are the first frog to post a story from Nicaragua! Man, Polly’s been there. You’re lucky, but I have to ask a question. When did that volcano erupt?